Online advocacy tools are ubiquitous. But what do you do at a fast paced outdoor social event where you can’t be in front of a computer, connectivity is always dicey, and you have multiple locations across the country at the same time? Human Rights Campaign needed a solution to collect member and supporter information that was safe, secure, accurate, and available on a national level in real-time. It was also important that their new donors were followed-up with and thanked after the interaction at a Pride booth. Grassroots Unwired worked with HRC to ensure that our platform met every need they had. The “off the chart” numbers they produced the first summer tells the story. HRC has been using the Grassroots Unwired platform for their street canvassing efforts for several years now. When the Pride team saw the awesome impact our tech was having on their canvassing numbers, they wanted in. Encourage attendees to take action on behalf of LGBTQ issues. Manual process required for tracking mail-order premiums. Based on feedback from the staff at HRC, Grassroots Unwired added features to an already best-in-class mobile advocacy platform. The new app put in place for the Pride festivals used the same philosophy and overall technology already in place for the canvassing application. Partnering with HRC took the app to a new level with a lot of cool twists and turns. 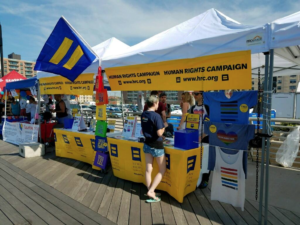 When an enthusiastic Pride participant walks up to the HRC booth and spies a t-shirt they want, the volunteers can collect their contact information, sell them the shirt using a card swipe, encourage them to join as a member and/or send a shirt to someone else as a gift then send them back into the fray in a matter of minutes. The volunteers can use the same app to acquire new members, sustainers or annual donors. The best thing is this technology can be updated on the fly by the client themselves. If they run out of a specific t-shirt, remove it from the system. If they decide to change the donation amount, login into the dashboard and make the change. 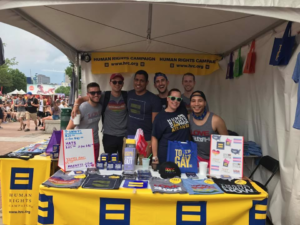 Our teams worked hard together to make sure this new type of application can do everything in the Pride booth that HRC has been doing on paper forever. This summer, the application will end up being used at more than 250 venues. We are so proud of this type of innovation and can’t wait to do more. Collect more donations and sign up more new members than ever before. The reporting and data is calculated on each tablet. The administrator can login to the dashboard to see daily totals instantly as opposed to spending hours reconciling charges. The Booth staff love the fact that it takes minutes to double check their daily tallies rather than hours. Management loves the advanced reporting and the ability to know the outcomes mid-shift, end of shift or across the country in minutes. The data collected is then sent to the database of record where it can be used in many other campaigns throughout the organization. With the email and cell phone verification tools on the tablet, the data being collected is far more accurate which has cut down staff time back at the home office. Less emails are bouncing when applied to other campaigns because they haven’t been transferred to the database by hand. HRC says that they have been able to cut down their volunteer staff to a core enthusiastic and trusted group which has helped improve security on-site. Patrons feel more comfortable making a donation using the tablet and swiper because it’s encrypted, securem, and more like what they are used to seeing at a retail store. We love this application and see the use being carried over to many more use cases brought to us by new and old clients alike. Our next innovation will be to apply our technology at Run/Walk events. If you have a crowdfunded sports event and are trying to solve the problem of mobile check-in, increased donations on-site, and product purchases, give us a call or request a meeting.